Frohawk Two Feathers is the artistic alter-ego of Umar Rashid, born in 1976 in Chicago, Illinois. A performer, writer and artist, his work is filled with real and imagined colonial histories and often takes the form of mixed media paintings that resemble Native American ledger paintings. Central to the understanding of Two Feather’s work is a construct he calls “Frengland.” The artist explained, “Frengland is a place I created that presupposes that 18th century England and France were never at war with each other and that they merged into one huge, unstoppable colonial empire. Imagine all the countries they conquered put together. They’d put a flag in most of the world.” And Those Figures Through the Leaves. And That Light Through the Smoke is the second installment of Two Feathers’ “The Americas” series, which takes place on the continents of North and South America. The title of this exhibition derives from “Sleeping Ute,” a song by the Brooklyn, New York-based band Grizzly Bear. It tells the story of the 1792-1794 journeys of two young, optimistic “Frenglish” military scouts and their companions. Although they have lost support for their mission—the Frenglish Republic withdrew all funding due to the threat of war on the European continent—and are harried at all sides by man and nature, the scouts and their entourage continue on their mission to reach the Pacific. 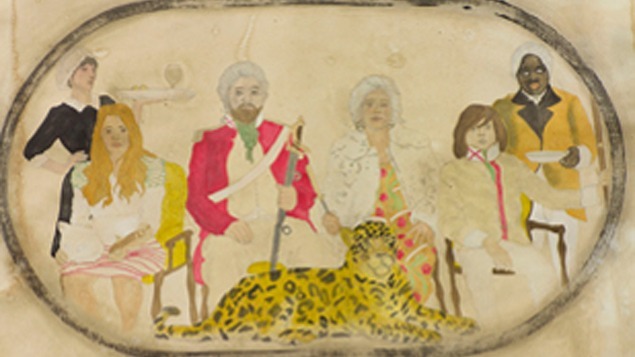 The exhibition will include acrylic and ink portraits of key Frenglish characters featured in Two Feather’s narrative, and imaginary colonial maps, among other objects based on the artist’s extensive research into the customs, clothing and weaponry, and geography of the areas represented.